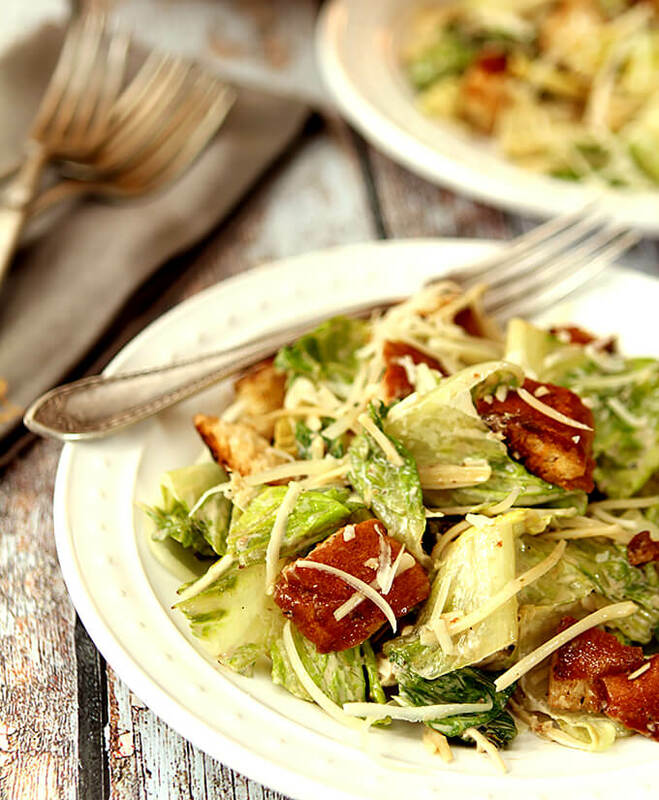 Making this Grilled Caesar Salad with Homemade Croutons might take a leap of faith but you’ll soon be thanking me; it is absolutely amazing! Grilled salad? I know, sounds weird doesn’t it? I was filled with a sense of disbelief and certainly some trepidation myself when I was first introduced to a salad with grilled Romaine lettuce a couple of years ago at the Snowmass Culinary and Arts Festival. The cooking demonstration by Diane Hendricks was fun but the best part was my first taste of that smoky, delicious salad with grilled Romaine. That salad was finished with a simple dressing and served on paper plates for a crowd but I learned something new and have since used the same technique to make this Grilled Caesar Salad with Homemade Croutons on several occasions. Be forewarned…do NOT try this with iceberg or green/red leaf lettuces; OK? I invited some friends to join me for dinner this past weekend and wanted it to be easy to prep and prepare so we could actually visit. Making everything on the grill, including the salad, sure helped. I don’t know about you but I’ll grill all year round so this is not a salad relegated to just the summer but if you don’t like doing it outdoors when it’s freezing, it works just fine using a kitchen grill pan too. Not surprisingly I had several dietary restrictions to consider so I couldn’t help but wonder if someone would have an issue with the raw egg I would typically use for Caesar Salad dressing; I’ve got a couple of recipes that call for raw egg and I’ve never had any issues but I wanted to proceed with extra caution. I decided to coddle the egg I use in my favorite recipe; a simple procedure that requires submerging an egg in boiling water for exactly one minute. The egg surface and the outermost layer of the egg white will be cooked slightly thus eliminating some of the risk carried with eating a raw egg, however, it’s important to note it does not COMPLETELY remove the possibility of contamination. If you’re concerned that this procedure isn’t enough then use a pasteurized egg or just substitute the egg with a dollop of mayonnaise the size of an egg yolk; the taste and texture will be changed slightly but it’s still a great flavor. The salad has a couple of nuances that made it a bit unique from what I’ve done in the past. Those anchovies? Not skinny sliced fillets at all but anchovies from Wild Planet. 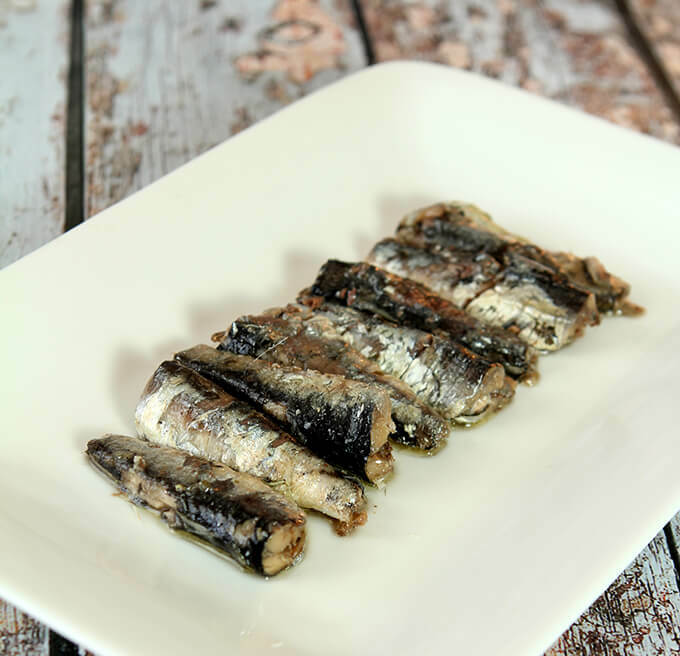 Also known as boquerones in Spanish restaurants worldwide, these sustainable white anchovies are smaller and more delicate in texture than a sardine, with a clean, mild flavor that is the perfect compliment to this dressing. An easy appetizer was to top some cream cheese with my favorite Blackberry Serrano jam and then I accompanied the appetizer with Lemon Drop Martinis. 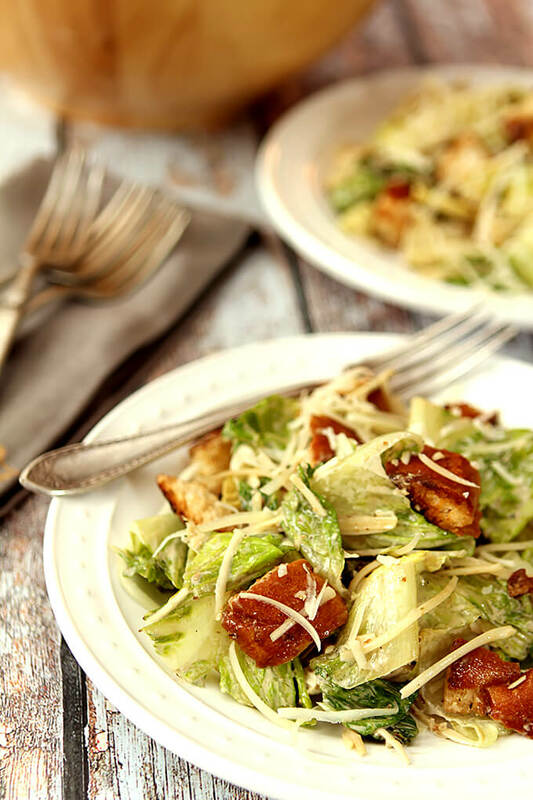 When I decided to make this Grilled Caesar Salad with Homemade Croutons; I thought it would work for everyone if I simply provided some options. I grilled chicken and flank steak and served more accompaniments in bowls for everyone to choose from; chopped hard boiled eggs, Parmesan cheese, homemade croutons and both regular and anchovy free dressing for the salad for those who were vegetarian. Everyone could not eat everything but there were enough choices that all were able to prepare their salad with what they could eat and it was the perfect choice. I was the lucky one…no food allergies for me; I got to add it all! The coup de grace for me are the homemade croutons; I could make these and never get the salad done I love them so much. You know the routine, ‘I think I’ll just have one more’ turns into ‘where the heck did the croutons go?’ very quickly! Great in this salad, this same recipe is also perfect for croutons for soups so don’t forget this come winter; the same precautions about eating them up applies! I made this for dinner again last night…this could become a habit. A really yummy habit. 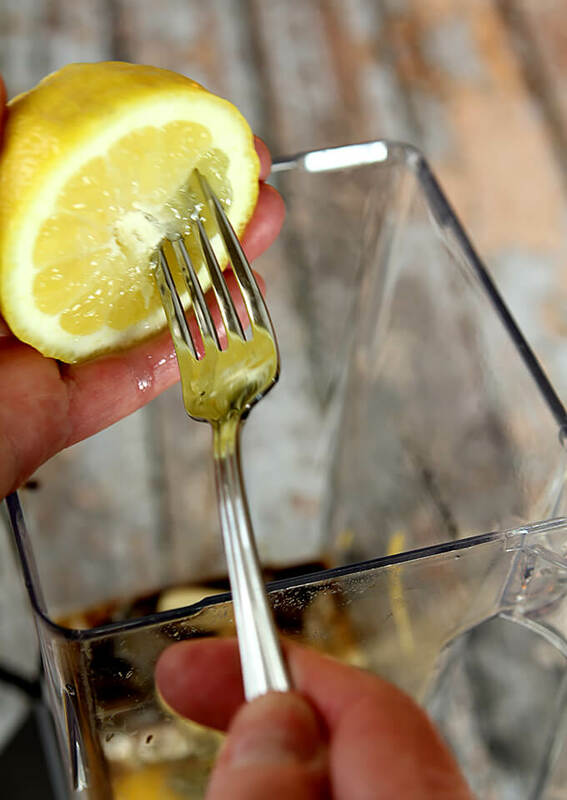 When I'm juicing just one half of a lemon; I simply use a fork. Puncture the membranes with your fork and give a little twist; the juice will run out. Give a quick squeeze of the lemon when done too and there ya go! 2 medium heads of romaine lettuce -- outer leaves removed and cut in half; do NOT remove the stem end; that keeps it held together on the grill. Combine the garlic powder, melted butter, olive oil and salt in a large bowl. Mix until blended; add the bread cubes and toss until evenly coated. Spread the bread cubes onto a baking sheet and bake for about 10 minutes until the bread is golden. Remove from the oven and allow to cool. Bring a small pot of boiling water to boil, add the egg and cook for just 60 seconds EXACTLY. Remove the egg from the water and place it in a bowl of cold water to stop the cooking process and cool the egg. Combine the balsamic vinegar, Worcestershire sauce, lemon juice, garlic, salt & pepper, anchovies, mustard and capers in a blender or food processor; crack the egg and add it to the other ingredients and mix well. While blending, pour the olive oil into either the blender or processor in a slow stream until thoroughly combined and thickened. Brush the Romaine lettuce lightly with olive oil; place on a hot grill and grill on both sides for approximately 2 minutes each side. Remove from grill to a plate and allow to cool. Pour half of the dressing into a large bowl. Cut the romaine lettuce into 1 inch pieces and add them to the bowl ; mix until the leaves are all coated. Add the Parmesan cheese and croutons, toss and serve on chilled plates. Pass the remaining dressing for individuals to add more if they choose. Or save it for yourself for later. It looks delicious and healthy, thank you for sharing this one. I will try it soon. Thank you…we absolutely love it! We enjoyed a very similar salad at a restaurant in Houston recently. I’m so glad that I now have a recipe to try! It was so good I think I ate it for dinner 3 nights in a row (or until I ran out of Romaine!). Wondering where you are in Denver Monet; we should connect for coffee sometime. I have a jar of the other kind; I should have done a comparison shoot huh? These are much fatter AND milder and for my guests, that worked. If it has been just me? I would have probably doubled up. But…like salt, you can always add more but it’s hard to take away! I love grilled ceasar! And I’ll have you know that i hate to ask THAT question! It looks like you pleased everyone! 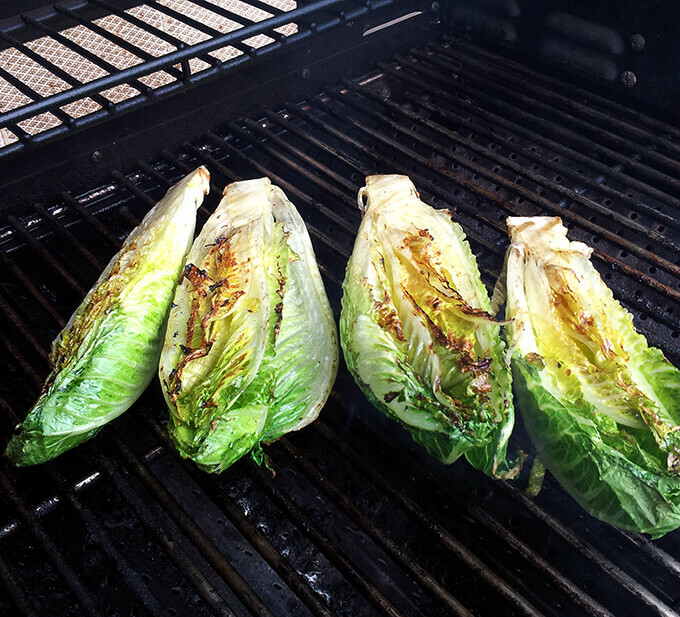 I’ve done the grilled romaine and it is fantastic – when we had our boat, for the first few years the ONLY cooking facility I had was a hotpot, toaster and a bbq so I got very, very good at cooking everything on the grill!!! I have got to try that dressing – never thought of putting capers in a caesar but “duh” it totally makes sense!!! What a fun get together – I lover reconnecting with people I haven’t seen in years!!! BTW, I love the background texture of your photo!!! Grilled romaine is just so delicious. And with your homemade croutons and dressing I’m quite sure it was to-die-for! I’m going to be looking for those anchovies on my next shopping trip. They are so mild that I could have actually put more in but with all those dietary restrictions I played it safe…adjust as you see fit to your tastes. I love grilled romaine! And make it into Caesar salad often. I usually use pasteurized eggs these days when I need raw egg in something — the chances of getting a bad egg are very rare, but why take chances? Coddling is a good idea too. Good recipe, and it sounds like you had wonderful company to share it with! Pasteurized eggs are still hard to find; the one large store near me needs advance notice to get them in. I’ve been washing my eggs with detergent and decided to start going this route as another protection; sometimes a girl needs a Caesar salad and didn’t know it two days before! It sounds like a great evening with friends. Isn’t it nice to reconnect after a while? I just attended a college reunion and thoroughly enjoyed catching up on lost time. I haven’t grilled salad before but will try it next time the grill is fired up. Looks wonderful! You have to try this…it is surprisingly wonderful; most of the lettuce retains the crispness you would expect but it’s all permeated with a nice smoky flavor. SO good! It is so nice to reconnect with old friends. Grilled romaine salads are delicious no matter what you dress them with, but you can never go wrong with Caesar. This looks divine. It has been nice; heck I’ve even connected with some kids I babysat for in my teens and love that they remember me so fondly so this Facebook thing has been a good thing.